A trailblazing payload for the National Reconnaissance Office successfully rocketed into orbit on a Minotaur 1 booster Sunday, beginning a secret mission testing new ways to collect intelligence from space. The mission was codenamed NROL-66 in the agency's rocket acquisition naming system. The payload is also called RPP, which is short for Rapid Pathfinder Program. "I commend everyone who made this launch successful," said Robert Brodowski, director of the NRO's advanced science and technology directorate. "This mission is just one example of our ability to rapidly build and launch small spacecraft with on-orbit capabilities that increase the value of NRO systems to our nation's future." An NRO spokesperson disclosed before launch the payload will demonstrate better ways for U.S. government satellites to gather intelligence. The U.S. spy satellite agency hasn't revealed what techniques or sensors the craft will test in space. Its cost, contractor and size are also secret. But the lightweight payload launched on a Minotaur 1 rocket, the smallest booster used by the NRO since the agency's existence was declassified in 1992. The Minotaur's nose cone can fit a spacecraft as large as a kitchen refrigerator, and the four-stage rocket can haul nearly 1,000 pounds into low-altitude polar orbits. 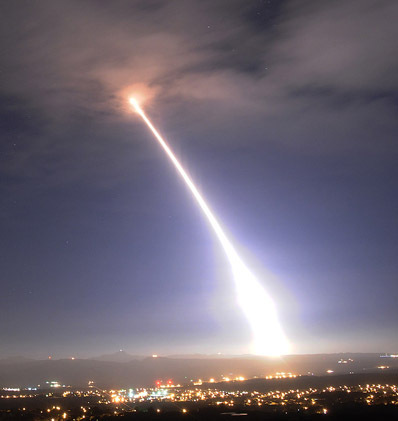 The Minotaur launcher blasted off at 4:26 a.m. local time (7:26 a.m. EST; 1226 GMT) from Vandenberg Air Force Base, Calif. The launch was delayed from Saturday by a transmitter glitch in the Air Force's network of tracking and communications equipment. The six-story rocket swiftly climbed into the predawn sky, breaking the sound barrier seconds later and shedding its powerful first stage a minute after liftoff. Its second stage burned for another minute to propel the rocket nearly 400,000 feet high. Two more Minotaur stages were supposed to accelerate the vehicle to more than 17,000 mph before deploying the satellite. An NRO press release Sunday said the launch was successful. Based on safety information released to mariners and pilots, analysts believe the Minotaur rocket flew south from Vandenberg, dropping its spent rocket motors in the Pacific Ocean and achieving an orbit circling the planet's poles. The Minotaur 1's first and second stages were pulled from stockpiles of decommissioned Minuteman 2 intercontinental ballistic missiles. The smaller Orion 50XL and Orion 38 third and fourth stage motors come from air-launched Pegasus rocket program. Cobbling together unused government-furnished missile stages and commercially-available upper stage motors make the Minotaur rocket family an inexpensive launch solution for defense satellites. The dimensions of the payload's orbit were unknown Sunday morning. The spacecraft could be circling in a polar orbit with a ground track nearly perpendicular to the equator, or the Minotaur could have been aiming for a sun-synchronous orbit commonly used by Earth observation satellites. Other types of north-south orbits were also feasible. Sunday's launch was the first time an NRO payload flew on a Minotaur rocket. Most of the organization's payloads launch on much larger Atlas and Delta rockets. The NRO's space fleet includes optical and radar reconnaissance missions, communications and eavesdropping spacecraft and ocean surveillance satellites. The agency usually doesn't reveal the purpose of an individual payload. Rare exceptions include the STEX space technology experiment satellite and the GeoLITE communications testbed launched in 1998 and 2001. The NRO hasn't reserved any further flights on Minotaur rockets, but future technology demo satellites would best fit on small-class launchers. The Minotaur 1's next flight is scheduled from Wallops Island, Va., in May with a satellite for the Pentagon's Operationally Responsive Space program. Called ORS 1, the spacecraft will carry an electro-optical and infrared sensor to supply battlefield intelligence to U.S. Central Command. A larger Minotaur 4 booster will also launch in May from Kodiak Island, Alaska, with the TacSat 4 experimental communications satellite. The next Minotaur launch from Vandenberg is expected in August. It will be a suborbital mission with the second Hypersonic Test Vehicle flight for the Defense Department's research and development agency.